Yesterday, we heard how Sony Interactive Entertainment Chairman Shawn Layden sat down with Game Informer and sent some praise in the direction of the Nintendo Switch, Xbox One X and even tablets and smartphones - stating how there are great gaming experiences across all of these platforms and explaining how each of these systems are tied to the same community. To follow up these comments, Layden has acknowledged Nintendo for a second time at this year's DICE Summit, currently taking place in Las Vegas, Nevada. While discussing this year's theme - which aims to highlight industry trailblazers, Layden said to "never underestimate Nintendo" and admit everyone within the video game industry was "better for their efforts." It's a rarity to see Sony acknowledge the competition like this, especially when considering the current cross-play debacle. In fairness, we're beginning to see some changes in this area, with full cross-platform play now available in games such as Rocket League. What do you make of Shawn's comments about Nintendo? Do you think the video game industry and gamers, in general, should be more thankful for Nintendo's efforts? Tell us in the comments. But PS4 still doesn't have a large amount Great Kiddie games (Mario, Kirby, Animal Crossing, Yoshi, Mii games, etc) like Nintendo did. Well yeah without Nintendo Sony wouldn't know who to copy. @XenoShaun In fairness Sony doesn't need to copy Nintendo. They have been the leaders for the most part all 4 of their generations. At the very least been pretty close to the leaders when they lost. I just need Appropriate games (Safe for Kids) for me, Not a bunch of OMG ULTRA HD 4K rated 18+ games. Existence is better because of Nintendo as well. They don't need to, yet they do. That's pretty telling. Competition is a good thing. If there is no one to compete with, there is no demand to improve. Sony understands this. That's why 2K and EA's sports games and other similar licensing deals are bad for the industry. They make it impossible for other companies to make competing products and drive innovation. As well as the change to give the Star Wars license to EA is also just as bad. @Anti-Matter You do realize that being ultra HD and 4K have absolutely nothing to do with the game's rating and content, right? Tomorrow Nintendo could announce the Switch 4K God-system and Animal Crossing could be the very first portable Ultra HD 4K game on the system. Further, none of the big 3 game companies, Sony, Microsoft or Nintendo, allow 18+ AO games on their platforms at all. The same cannot be said for Sony, I'm afraid. Nothing wrong with stealing your competitions ideas if they’re good ideas. That actually shows humility, to be able to swallow your pride and accept your competitor is better st something than you are. It’s a lesson Nintendo could learn. Doing things right is better than doing them differently but worse. Safe for kids? You look like an adult. Am I missing something here...and these PS4 games that I'm personally interested in range from whimsical and cartoony to blood soaked carnage Ala mortal kombat 11 ect. What I'm saying is the PS4 offers a wide variety of games(aside from being next gen) that the switch simply put does not and the superior versions to games like Doom, resident evil revelations 2, even dragon Ball fighterz and so on. Man, must of sucked being N64 exclusive considering how fantastic the PS1 one was. Nothing against the N64 it had a handful of groundbreaking amazing exclusives(Mario 64, OOT, golden eye, ect) but again you truly needed both consoles. damn right Nintendo did good, but don't doubt yourself Sony you still got the PS5 that can end most of PC gaming. @WaveBoy That's what a gaming pc is for! It is an essential companion piece if you are a Nintendo (Switch) only console player. If you've got a Switch and PC you're covered. Also, I'd argue that you don't NEED two platforms. It's nice to cover your bases, but as I get older I'm starting to realize just how much time and money I wasted trying to play everything out there. @Anti-Matter The irony in Nintendo's "kiddie" games is as an adult, I prefer to play them much more than "realistic" or "gory" games. May be it's because I really start to appreciate good game design than flashy graphics. Edit: I'm not saying realistic games don't have good design. There are plenty of great ones on all platforms. At the end of the day, aesthetic and gimmicks don't carry games. They may make quick bucks but it's bad for everyone, including the people who are making money temporarily. That's literally the only PS4 exclusive game I've ever beaten. One of my favorite games of the generation. @puddinggirl What's also ironic is that many MANY kids gravitate towards playing the more "mature" adult games because they think those games are cooler to play than ones designed as kid/family games. The number of kids who saturate games like CoD are a testament to that fact. This. I love The Witcher 3, but I usually play like one big budget game on that scale a year and most everything else being indies and Nintendo first party titles. I was primarily a PC gamer back during the Wii U, only playing the few worthwhile Nintendo first party games on the system and spending the rest of my time on Steam. Now it's the opposite, I rarely play on my PC just because the Switch has such a good library and it's much more convenient. Agree, as a kid I was always trying to play the bloody and violent games my older brothers were playing and would be embarrassed to get caught playing Kirby or Mario. Now I look at games like CoD as breeding ground for annoying squealing kids online and I happily play my Nintendo games. When i browsed games from PS4 Store, my face was frowning all the time, 😒indicated i really felt disgust to see adultery images almost dominated the page. I ALMOST cannot find any Cuteness / Kiddieness just like Nintendo did. Even from PS4 Avatar itself i don't like at all, like there is NO cute Avatar like on Nintendo. Even there were some cute avatars on PS4, but it still can't match or as good as Nintendo did. I felt i was NOT fated to getting along well with Sony after PS2 era. Sony failed to impress me despite i have a few PS4 games. I was fated to falling in love with Nintendo. @Lagster_YT Being a Minecraft fan myself, I can see where you're coming from. Hopefully it's coming soon. Sorry, but i'm against rated 18+ games. When i saw Nintendo Switch games library, it was EASILY to find Kiddie / Cute games such as Neko Tomo, Little Friends : Cats and Dogs, Yonder the Cloud Catcher Chronicles, Portal Knights, Mario games, Yoshi games, etc. I found Almost NOTHING from PS4. So this is their big announcement outside of CES, wow. This must be really sad times for Sony. Sony company of CENSORSHIP and blocking of CrossPlay aka FortNite and probably more. Now they come talking about how to be "let's join hands" and sing kumbaya. Really, this is the best you can say. When a big Sony has to say that it tells you the brain drain and lack of Innovations is lacking nor coming from Sony anymore. That's the big news of this announcement from the Execs who has no clue. I know the 4K is a part of entertainment technology. But what i don't like from 4K is because the games / movie developers keep milking the 4K for making more disgusting rated 18+ entertainments. @Anti-Matter That's a pretty harsh and unfair statement. Just because something doesn't fit your own personal tastes doesn't make it such an overwhelmingly negative thing. Believe what you will, but people can like different things. Yikes, Shawn Layden has always been a nice guy and gives credit where credit is due. Some of the people in these comments though ... We all love Nintendo, but you're acting like Playstation is the worst thing since Trump became President. I still play a ton of their exclusives and love mostly all of them. 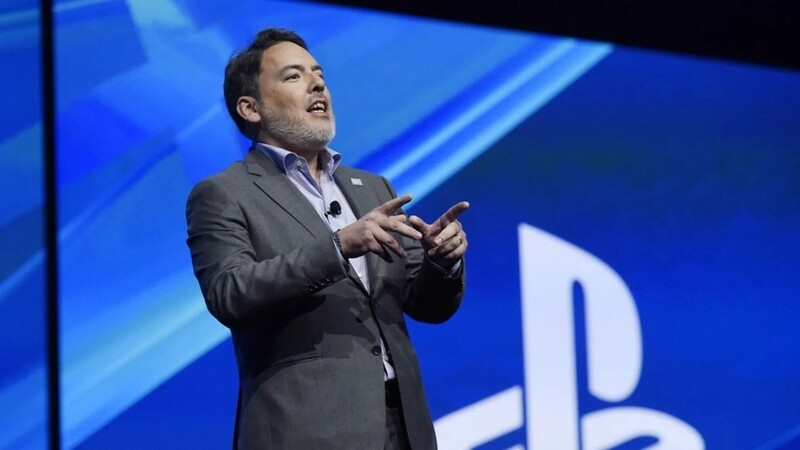 Playstation and Shawn Layden care about making good games, aint that good for everyone? "Almost half of the games on the PS4 are rated E for everyone. There are plenty of kid friendly games to choose from." Just only those games (Matched with my taste) i can got on PS4. If i found the games also on Nintendo Switch in physical release, i will definetely choose the Switch version. The industry was better because of SEGAs efforts too but they arent really around anymore like they use to be, hey Sony. @Anti-Matter that's a problem with you not knowing how to find things, not a problem with what is available. Saying there aren't any kid friendly games on ps4 is just not a true statement and you should stop saying it. So you're the guy always drinking tropical punch kool-aid at my house parties. Kidding! I want what soda papinksi is drinking. 😈 but seriously man, the majority of those 'cutesy' franchises you threw down I want no part of aside from Mario and yoshi. I'm sure I can speak for 99% of the people here as well. Also, I need horror games almost as much as I need colorful whimsical cartoony games from the likes of Nintendo, Capcom ect. Like...resident evil 2, how could you miss out on such a fantastic game? DOOM, resident evil 7, devil may cry series, god of war, there's even a spyro the dragon remastered trilogy which may in fact float your boat. He's right on that one! Nintendo helps the industry thrive. I honestly think the N64 was better than the PlayStation One and I certainly had more fun playing it from my own point of view. The PlayStation 2 was the first PS to make me consider leaving Ninty but the GameCube was just too good as well. I went dreamcast then GameCube. I never got into the PS2 aside from playing a small handful of games at friends houses like devil may cry which was the standout. I remember the PS2 having such a horrible miserable launch especially in comparison to the dreamcast. Now THAT was an amazing launch. @Anti-Matter there are still kid friendly games on PS4, you just need to know where to look. There are tons of racing games and sports games they can enjoy. Even some AAA games aren’t too adult, like Horizon Zero Dawn which is a masterpiece. Nintendo is best for kid friendly games, that’s for sure, but PS4 has a lot of games suitable even for you. Sure there was a few 2D games on the N64. I definitely remember MK Trilogy and Worms Armageddon at least. Never owned or played a Saturn or Dreamcast to my shame. "Never underestimate Nintendo" is easy to say now that the Switch is selling like hotcakes. In the darkest hour that was the Wii U era, such statements were nowhere to be seen. Sorry, but i ONLY have interest with Kiddie / Cute / Cartoonish / Girlie games. I have NO interest with Too Realistic graphic games. I hate shooting games, horror, evil games, any rated 18+ games. Well BloodBorne it's my all time favourite game. And I am a die hard Zelda lover to the core, played and loved all of them. So, well yeah, I'd say 1 exclusive is enough to make me buy a PS instead of a PC, considering PC exclusives are not a thing. Oh, RDR2 is also a pretty damn nice game and God of War is also pretty good, so I'm for Switch + PS4 over a PC. Exclusives are all that matters. I would say Switch + PS4. As PS4 gets all the multi-platform games that are on PC, but Pc doesn't get all the Sony exclusives (+ Red Dead 2). I will always value exclusives more, just the same reason why I've been sticking with Nintendo for the past 20 years. I like this guy Layden better then many other guys in the industry. Like sure, at the end of the day he's a Sony employee and will do what's best for Sony and Playstation, but speaks like someone who cares about the industry as a whole. And let's never forget the PS1 was born because Nintendo turned down Sony's proposal to use CD for the N64. Correct me if I'm wrong but Nintendo have always spearheaded the gaming industry. They were experimenting with VR back in the 80s, albeit a failed attempt. Their NES controller was revolutionary at the time, before this you could only use a joystick or mouse/keyboard. The N64 took that one step further by including rotational thumbsticks that have almost completely replaced the old D-pad. The DS was the first consumerised touch screen long before Apple's iPad. The Wii introduced motion gaming to the home console market which spawned knock-offs from the competition, XB Kinect and PS Move. I'm sure there are many others. About the only area in which they're trailing is the graphics capability, which is well documented to be important to only some people. Only one possible explanation: Sony wants some Nintendo IP on their platform. It might even be in the work. A crossover maybe? Super Mario Bandicoot? The Legend of Horizon: Zelda Dawn? Kratos' Mansion? I have lesser negativity with my PS4 lately. I played Portal Knights PS4 and The Sims 4 PS4 quite long yesterday. I also uploaded a screenshot of Portal Knight PS4 gameplay as my PS4 U/I. But because i still prefer Nintendo games a lot, i could consider to buy a few PSP games during this year and the rest on the next year. In my opinion, despite i have PSP now but PSP is still a mediocre machine. NDS and 3DS are still the Best for me and much much better than PSP in term of games library and machine model. I changed my mind to NOT sell my PS4 Slim. But i still not consider PS4 as Primary machines. I treat it as Secondary machine instead. "It's a rarity to see Sony acknowledge the competition like this"
Not really. I can remember several instances of Shuhei Yoshida doing so throughout the years, as Phil Spencer does when it comes to Microsoft. What you will never see is Nintendo PR praising the competition. Kingdom Hearts = i have the game. Ratchet and Clank = i sold the game after i played for 2 hours, 2 years ago. All the Lego games = Only Lego City Undercover i have interest, but i have finished the Wii U & Switch version. Naruto Ninja Storm series = No interest whatsoever with Naruto franchises. "There are tons of racing games and sports games they can enjoy." "Even some AAA games aren’t too adult, like Horizon Zero Dawn which is a masterpiece." I have ever saw a little bit from my sibling's gameplay but i have No interest at all with Too Realistic HD graphics like that. Beside, i didn't even like the character design, the scenery i saw, the sound effects, etc. I founded Horizon Zero Dawned rated PEGI 16, 18+ on Chinese rating so... Big No No from me. Well, did you understand if i was really HARD to be impressed ? My preferences are mostly something very different with some gamers here. So, Cute / Colorful / Funny / Kiddie looking / Quirky games are my main interest. Not the Serious or Too mainstream looking. @Anti-Matter loud and clear. Everyone and my fish knows your gaming preferences by now. You have repeated this everyday in Nintendolife. When you say 'Nintendo could learn from this', I'm not sure I agree completely there, I think Nintendo does what Nintendo want to and does not follow others, or even go with what fans want or expect.. Obviously they do it for many reason including money based reasons, but overall I feel they do what 'they' think is right first and foremost. I would say their attitude is more 'This is what we do if you want to buy' and if you don't there are the others. I personally wouldn't want them to change that, and I do not care that they don't fulfil all the things I want from them. I just enjoy what I get and it more than fills the time I have available to spend playing games. @Heavyarms55 I wish more ips had a similar open licensing strategy to Warhammer 40k. You get some lackluster games, but you also get some amazing gems like Vermintide, Dawn of War, Space Hulk, and Total War: Warhammer series. A lot of variety in gameplay and tone, that still fits the ip. Then we go to the opposite side of the spectrum, with EA and 2k. EA releases two games for Star Wars, one being a direct sequel, and neither of them is really "finished" at release, and rely on DLC and excessive MTX to complete the experience. In the same time, before this deal, we had more than a dozen Star Wars games, and a lot of them were decent to good, a few even being amazing. I loved the original Battlefront 2, KOTOR 1/2, and Rogue Squadron. But now we have clones of Battlefield, which wouldn't be a problem if Battlefield wasn't getting a bit stale as a series. Both EA and 2k hold exclusive deals with sports franchises, so they just release what is essentially the same game every year, with slight graphical improvements and updated stats/rosters, then load them up with egregious MTX. Things like this can happen, because EA and 2k are the only place casual gamers can get their fix. I have a switch and PS4 but if I could only have one it would definitely be the switch. Although Xbox has the best online its exclusives don't excite me. Not a fan of God of War or Uncharted but Bloobourne, NIOH, etc are sweet. Plus I love the farcry series and the tombraider reboot has been fantastic. But Ps4 doesn't have smash or mario kart or the other Nintendo exclusives. For me, I buy Nintendo systems for a few games. It used to be my go to. Through the launch of WiiU, I would try and buy some games to play on the system just to support it. There are just too many better games to play on PS4. How many of you have played through Red Dead 2s story? It’s probably the most moving storyline I’ve played. You can’t play Tomb Raider or Spider-Man on Switch.... which is crazy to me. I know Spider-Man is exclusive to Sony, but where is Nintendo’s equivalent ? There’s some overlap that Nintendo and Sony are competing for. Nintendo has the casual and kid market cornered. Sony has the mature market. Competitive would choose pc or Sony. I used to care about Sony's exclusives, but I don't care for the movie game approach they're taking to most of them. If you want graphical fidelity, options, and mods, Sony's underpowered box ain't the best choice. @Jriibz that’d be great but we have a ways to go to see if it measures up. @Regpuppy My main point in the licensing thing is that, when one company holds exclusive rights to something, it means they have no real competition. Madden for example is THE realistic American Football game. No other game gets serious consideration because they can't use the real teams and players and that's what sports fans want. Having the exclusive rights to use those teams and players in their game means they have no competition to worry about. Other Football games are forced to do something different with the genre or make a generic game that will at a massive handicap. In the case of Star Wars, before Disney bought and ruined it, Lucas Arts would work with a variety of studios to produce a wide range of games, RPGs, shooters, fighting games, etc... Now EA has the sole rights to it and we get... well EA games. All flash and micro-transactions, with all the production value spent on graphics alone. EA doesn't need to worry because its not like they have to compete with anyone. Other companies can make sci-fi games, but they can't use that well known and widely loved Star Wars universe. @misterMike Yes I agree that people want a reason to blame Sony for something. But I actually don't, I am a Sony fan obviously that's why I want cross-play. I don't really think its the new hip thing just more the fact that now that its in the air I wouldn't mind having it. If I can play games like Minecraft with my friends on Xbox and switch I would like my PS4 to be right along with them. Its a really cool feature for big name consoles to have so I don't think the smaller gaming companies are ever going to get blame for not having it. Honestly Its not something every company has to do or that's really important, but why not? At least they admit it. I don’t mean changing the way they develop games or the over-arching design of their hardware. I just mean that if you see the conpetitors offering things like a good Online Service, proper Communications options, Bluetooth headphone support, Analogue triggers, headphone jacks on Controllers, video streaming services etc. there’s nothing to be gained by being ‘different’ if that means ‘inferior’. @Lagster_YT yeah there’s no difference between the companies. Nintendo doesn’t care about their fans anymore than Sony or Microsoft (they equally only care about our money). @Spoony_Tech In all fairness, he is right. They don't even need to copy for years now, but they do. Yet ultimately Sony didn't have a stake until the CDROM debacle on the SNES when Sony tried to pull a shady contract leaving Nintendo with the expense of the system and pressing discs, while all profit from licensing was 100% there's. Nintendo gave em the boot, and then we got the PS1. And what did PS1 do? Copied the SNES controller design as much as possible. There's other things then too, but moving forward. They mocked the Wii with waggle and waggle plus - then PS Move and that was ok on PS3. Kind of a large stretch from one color to many, Virtual Boy - PS VR. Sony has been aping Nintendo since the earlier mid 1990s. It has been hardware, accessories, software so it's nothing new. The fact they're being nice now, given their attitude with cross play, lame fortnite, and other garbage including their more recent censorship oddity antics comes off as a bit surprising. @LavaTwilight It's debatable because the best selling console of all time is still PS2. Nintendo is definitely a juggernaut in the industry but Sony is no less influential. It's a good thing to consumers when the industry is thriving. In fact, it's good to everyone involved. So Sony is absolutely right in saying this. It's the same to Nintendo - it probably hurts Nintendo more if Sony dies despite them being competitors. I love both Nintendo and Sony. They’re both doing different things in the industry, and it’s hard to say one is better or worse because they both have their strengths and weaknesses. I use my PS4 to play graphics-intensive games that have more grit to them. I play my Switch and 3DS when I want something that focuses more on clever game mechanics. I’ve found tonnes of games from both companies that I absolutely love, and I like that they are doing different things and have different goals. As far as Xbox or PC, I don’t hate them in any way, I just already have plenty of games between Sony, Nintendo, and my iPhone to occupy me. I never did understand gamers who like one company and passionately hate all the rest. And his absolute love for 'girly' games. He said it. I'm out! Resident evil 2 according to him is evil, guess that makes me a sinner! @Spudtendo calling ps4 underpowered. What does that make the switch? As somebody who loved the PS1 back in its hay day I've lost interest in literally EVERY single Sony exclusive....I don't care for metal gear solid anymore, uncharted, spryo the dragoon, ratchet and clank, infamous and so fourth. I'm kind of looking forward to the last of us 2 sequel and maybe the current god of war but other than that, nope. I have the PS4 for 3rd party titles, mostly for Capcom....heck, I'm probably better off getting a PC to have on the side with the switch. What's sad is that final fantasy, metal gear solid, crash bandicoot and whatever else are no longer exclusive to Sony. A handheld device primarily. Of course it isn't going to compete hardware-wise with dedicated home consoles. I don't consider the Switch a home console, so I don't compare it to one. The Switch is my go-to handheld device that I rarely play on my TV unless I'm playing with friends or my fiance. The PS4/Xbox One are closer to PCs than any console has ever been, and they just aren't as powerful. I have my PC connected to both a monitor and my television, and I play most games on PC with a controller on my couch. I'm just not that into portable gamig although i was blown away and heavvily into thr DS lite and even the 3DS to some extent...so the switch's main innovation(which isn't anything groundbreaking like the wii remote or even the wii u game pad, the latter being a mixed bag) doesn't really matter or appeal to me. I'd rather have that luxury of playing something like super Mario Odessy on a 60" high quality HDTV to get that amazing grandos experience that you just can't get on a hand held. So all that I'm left with is essentially a super wii HD .with inferior joycon gyro pointer controls vs the wii remote, the addition of HD rumble which us beat but barely utilized. Take the hybrid portability away and you truly are left with a safe Nintendo console. @misterMike Defensive much? The history is there of one using the other repeatedly for their own gain and that has nothing to do with feelings. They took what Nintendo did, refined it, got lucky capturing solidly 2 of the 4 console generations by an insane margin, and built and empire off it. Obviously it didn't hurt them, and there's no way to even speculate fairly had Nintendo not fouled up the N64 (carts over CD) design that it could have been dramatically different then and the generations since. It's in stone, all of it. It had nothing to do with the student beating the master, that's just a feelings loaded arrogant comment. I'd have no problems going PC, I hear RE2 can run at 4k plus 60fps and overall has sharper textures and lighting etc. That stands for literally every single multiconsole release im sure. @puddinggirl I'm not arguing over successes at all. With maybe the exception of the Wii, Sony have been competition leaders since the PS1 I think and for good reason. When it comes to innovation however Nintendo is always on top. I would love to see some of the PS games come to Switch, especially Suikoden. They're more likely to reach PS4 first though. @Anti-Matter you must be trolling at this point right? This is just a facade or an act right? There is no way you are still acting and saying things like that... Right? @misterMike you do know what sarcasm and a joke is right. I said it was a big stretch. That was not serious. The rest was on the nose. Sorry that hurts your fragile sensibilities. @Heavyarms55 That's exactly my point as well, so forgive me for being unclear in my post. The fame of these ips means these companies with exclusive rights don't have to try that hard with them, as long as they satisfy the bottom line of the ip owner, unfortunately. Which, thanks to the nature of their MTX, seems to be an easy thing to do for them. In all fairness whom Censor and blocked CrossPlay when asked? Sony is the culprit in this. There are simple and obvious things a company does that tells how they really think and these two are the big flavours. If he was saying as says then why not admit to Censoring games and blocking CrossPlay that way no one can go back on their words. But like to point out before NES we had American made Consoles and Games but not til the NES did it really change the Gaming market and Development. If Nintendo hadn't brought the NES to America you have to wonder what would've happened to the America Gaming scene and whom would've really Championed it. Nintendo was a Leader in this for good and bad but they started the Gaming Scene. Sony didn't come out til later and that is what some forgets or wants to forget. @DreamerAbe86 a poor decision. I didn’t like LBP much as I wanted more of a full game and design combo. MM is as lacking and more. I’d never pay up for it or either again. I get where you’re going but one vs two decades of history is another.